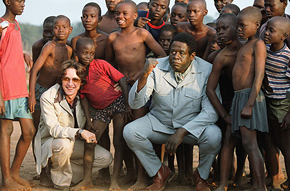 Publicity Stills of "The Last King Of Scotland"
In an incredible twist of fate, a Scottish doctor (James McAvoy) on a Ugandan medical mission becomes irreversibly entangled with one of the world’s most barbaric figures: Idi Amin (Forest Whitaker). Impressed by Dr. Garrigan’s brazen attitude in a moment of crisis, the newly self-appointed Ugandan President Amin hand picks him as his personal physician and closest confidante. Though Garrigan is at first flattered and fascinated by his new position, he soon awakens to Amin’s savagery - and his own complicity in it. Horror and betrayal ensue as Garrigan tries to right his wrongs and escape Uganda alive. 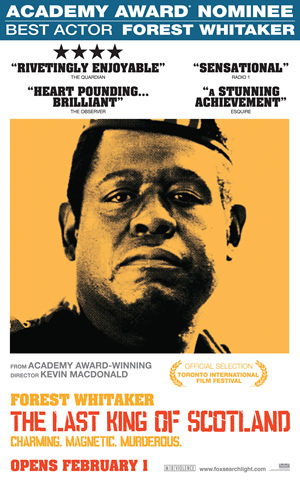 Forest Whitaker's fearsome portrayal of former Ugandan dictator Idi Amin saves The Last King of Scotland from collapsing under the white man's burden, the show biz notion that white heroes are wisest about African problems. Amin is decidedly the villain of the piece, as any despot who ordered thousands of deaths should be. Whitaker makes him as frightening as any actor could, not only for his violent temper but for the calm, even amusing lapses into an oddly likable personality. Each hearty laugh and moment of childish curiosity draws us closer, like rats being seduced by a cobra. Each twitch of Whitaker's wonky eye signals a madman ready to strike. This is a bravura performance from an actor mostly known for bearish vulnerability, unleashing danger that could erupt only from a role of invincibility. Critics' awards and the Oscar nomination coming Whitaker's way are deserved. The performance deserves more screen time than the circumstances of Giles Foden's adapted novel present. Amin is simply a key player in the journey of a fictional Scottish doctor named Nicholas Garrigan James McAvoy, who accidentally becomes Amin's reluctant personal physician. Garrigan (well-played with exuberant by McAvoy) arrives in Uganda from under the thumb of his autocratic father, looking for a little adventure and a way to do some good with his medical degree. 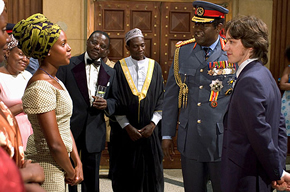 He first sees Amin (Forest Whitaker) when the newly installed ruler visits the village where Garrigan is working as a clinic physician, then has a chance to treat him following a minor auto accident. The dictator's flashy clothes, fast cars, and strangely deluded sense of self-effacement evoke all of the excitement and escapism the young Scot is looking for. When Amin offers Garrigan the job of personal doctor, the lure ultimately proves too gaudy to refuse. Soon, however, the shock of his own passivity jolts Garrigan into action, the countless number of kidnappings, murders and atrocities committed by Amin and his men more than he can ignore. With his soul on the line, the doctor attempts to make a difference but, in doing so, puts his own life in jeopardy. Running out of time and with very little room for maneuvering, the foreigner must try to get out of Uganda, wondering ceaselessly if his prior misdeeds make him worthy of survival. Looking without a doubt, at the heart of it all, it is the acting that ends up making this whole enterprise worthwhile. McAvoy is strong as the fictional Garrigan, making him strangely sympathetic even when his choices to follow and counsel Amin border inexcusable. Kerry Washington gives an astonishingly layered performance that broke my heart, while both Anderson and British character actor Simon McBurney disappear completely inside their roles. But there is no mistaking whose show this is, and Whitaker doesn’t just rise to the occasion as he so much vaults clean over the top of it. For the veteran actor, this is the best performance of his career, keeping attention riveted with a multifaceted titanic portrait that is undeniably Oscar-worthy. Fans who have followed the performer through films will not be remotely prepared for what Whitaker does here, the actor digging so deeply inside the paranoid dictator’s marrow the total effect of his performance borders on the horrifically unnerving. At its heart of darkness, the film is about the lure of power. It's a condemnation of all the dictators' men over all time. Emboldened by Whitaker's unforgettable performance, "The Last King" daringly puts forth reasons for such complicity.